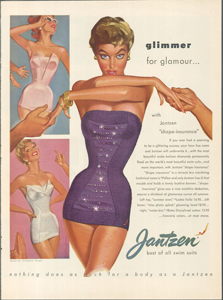 Swimwear manufacturer, Jantszen features a parade of delectable vintage inspired swimwear on their website (and some swinging music as well). Styles are reminiscent of those classic 1950s body firming long-line suits but with a 'modern interpretation'. The range includes plenty of one-pieces plus two- piece suits with high-waisted bottoms that can be scrunched down for a different look. Love it. Most appealing is the promise of mid-line body shirring to 'camouflage' and keep those flabby abs in check.